Fully automatic design or semi-automatic allowing designer intervention. Uses standard electrical circuit simulators as evaluation engines. Handles multiple circuit test-benches simultaneously. Performs geometric and parasitic layout-aware circuit-level multi-objective multi-constraint optimization. Provides a Pareto optimal front of circuit sizing solutions showing the trade-offs among the design objectives. Semi-automatic template generation from netlist. Template-based floorplanner with symmetry and automatic proximity constraints. Electromigration and IR-drop aware symmetric routing. Fast PEX enables layout-aware circuit-level multi-objective multi-constraint optimization. Includes a technology independent analog module generator to enrich floorplan solutions. 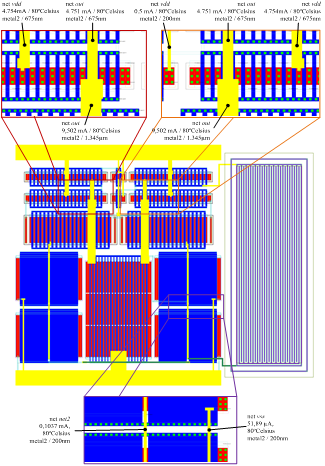 The AIDA framework implements an automatic analog IC design flow from a circuit-level specification to a physical layout description. The circuit-level synthesis is done by AIDA-C, and after the circuit-level design, AIDA-L takes the device sizes and the best floorplan, and generates the complete layout, which is then saved as a GDSII stream format. AIDA-C is a circuit-level synthesizer supported by state-of-the-art multi-objective optimization kernels, where the robustness of the solutions is attained by considering user-defined worst case corners, that account for process variations and(or) PVT corners. The circuit's performance is measured using Spectre®, Eldo® or HSPICE® electrical circuit simulators. Pareto optimal solution set for Area vs. DC Gain optimization with superimposed circuit layouts. AIDA-L considers sized circuit to generate the complete layout by placing and, routing the devices, while fulfilling the technology design rules by using built-in DRC and LVS procedures. The router takes into account the circuit's currents to mitigate electromigration and IR-drop effects, and a fast but accurate PEX procedure provides parasitic estimates to be used in AIDA-C layout-aware optimization. The framework's technology independent module generator, AIDA-AMG, is capable of creating several, simple and complex, device layout styles, allowing AIDA-C floorplan-aware sizing approach to explore a much wider space of solutions leading to higher quality layouts. Complete layout detailing the connections where EM effects caused wires width to increase.